More than a decade after initiating the “War on Terror,” along with invasions and occupations that brought regime change to both Iraq and Afghanistan, Washington’s defense planners face the arduous task of refocusing America’s military towards the threats of the future: defeating anti-access/area-denial (A2/AD) weapons and strategies that are quickly being adopted by nations and non-state actors alike. How will the United States deal with this challenge? Any defense analyst will tell you that reading the tea leaves when it comes to the future of America’s military these days is a thankless task. Those of us who track such developments for a living are fed an endless stream of information that, when combined, are prone to produce information overload. Even so, two paths seem pretty clear. The first choice is not really a choice at all. The United States could have a military that has been slashed to the bone thanks to massive cuts in spending through what is known as sequestration. Without any sort of strategy or purpose besides cutting costs and shrinking Washington’s massive budget deficit, this military would be unable to meet the challenges of the future, costing blood and treasure in the process while truly becoming “hollowed out.” Or it could have a smaller, leaner but high-tech military that can fight from long distances and that has a clear, defined strategy: defeating forces that would deny America’s military access to the global commons across multiple domains. The key to this? The ability to develop new weapons systems to strike from long distance. During the recent budget battle that brought America to the brink of default, very little was mentioned about cuts to the nation’s military, cuts that have already had an impact on readiness, training practices, and the ability of Washington to react in a crisis. While many politicians have sought to replace the sequester with some sort of common-sense defense planning, the cuts remained in place. They are already being felt and could degrade America’s military edge as nations like China and Iran develop specific anti-access/area-denial (A2/AD) weapons to deny Washington’s access to the commons. And given China’s recent declaration of an ADIZ over the East China Sea, a crisis is no longer inconceivable. “Sequestration poses the most serious threat to our military’s readiness since the days of the ‘hollow force’ after the Vietnam War” notes U.S. congressman and The Diplomat contributor J. Randy Forbes. “Today, only four percent of our Army brigades are fully ready and available to execute combat operations. Army and Marine units that aren’t scheduled for immediate deployment to Afghanistan have seen their training dramatically reduced. Our Air Force pilots have had their flight hours cut to the bone and only about 39 percent of the Air Force’s combat fleet is now rated as “fully mission ready,” he added. After 9/11, America’s military budget skyrocketed to meet the challenge presented by Al-Qaeda and commitments Washington made in Afghanistan and Iraq. Now, with U.S. forces out of Iraq and slowly withdrawing from Afghanistan, combined with large deficits and mounting debt, cuts to American armed forces were all but inevitable. However, cuts that have no strategic purpose, but are made just for the sake of cost savings and deficit slashing, could come back to haunt those who made them. “Sequestration cuts are having a deleterious effect on U.S. military capabilities because they are being carried out without proper planning or strategic guidance,” explained Todd Harrison, a Senior Fellow of defense budget studies for the Center for Strategic and Budgetary Assessments here in Washington D.C.
“In 2013, sequestration cut $37 billion from the defense budget, and DoD did not have a plan for how to implement these cuts in a strategic manner. If current law remains in effect, DoD will have to cut another $21 billion in 2014 – again without a strategic plan to guide the cuts,” he noted. Having to make such colossal choices was once unthinkable. If sequestration is left in place, clearly it will have a major impact on America’s standing in the world, including its status as superpower. Regional allies will rightly wonder if they can really count on America in their darkest hour. It could also lead states who face rouge nations or challenges on their border to dramatically boost their own defense spending, possible leading to destabilizing arms races in places like Northeast and South Asia. While the future appears bleak for America’s armed forces, there are those who argue Washington does have another path it could take. With a keen focus on the A2/AD challenges of tomorrow, the U.S. could craft a strategic vision that harnesses America’s technological edge. 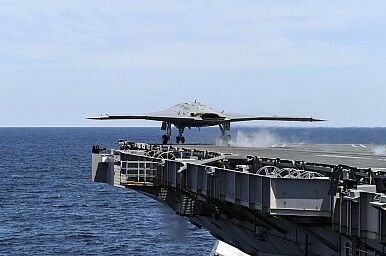 With targeted investments in technologies like unmanned aircraft launching from U.S. carriers, a new generation of long-range bombers as well as new nuclear-powered submarines bristling with long-range strike weapons, America would have more than enough military might to hold off any future anti-access challengers when combined with other parts of its military arsenal. As part of a long-range strategy, whether based on capable operational concepts like AirSea Battle or something similar, Washington would gain a clear edge over A2/AD competitors for years to come. One of the greatest offensive weapons of all time, the American flattop, is now under threat from weapons like carrier-killer ballistic missiles and long-range cruise missiles that in mass could overwhelm its defenses and render it as obsolete as the battleship. Yet Washington could have a solution to that problem: developing unmanned, long-range strike platforms that can launch from carriers and out-range the anti-access weapons and keep American carriers in the fight for years to come. Best of all, such weapons need not break the bank. “The UCLASS (Unmanned Carrier-Launched Surveillance and Strike) will enable aircraft carriers to find and strike targets more than 1,200 miles away or search for more than 10 hours without refueling,” explained Bryan Clark, also a Senior Fellow at the Center for Strategic and Budgetary Assessments. While UCLASS could provide a viable option for naval commanders to strike from distance in A2/AD environments, the very nature of the UCLASS program is under threat. Some would like to see the program scale back its vision, becoming essentially another drone with a long range but limited strike capability. “I believe strongly that to be effective in emerging threat environments in the Western Pacific and other regions, a future carrier-based unmanned combat air system must be stealthy, capable of automated aerial refueling, and have integrated surveillance and strike functionality” explained Forbes. Fighting wars in Afghanistan and Iraq while taking on terrorists all over the world is an expensive enterprise, one that did not leave much room for a military capability that is often taken for granted. Washington certainly did not invest in the long-range bombers that are now being sought by defense planners. While America’s B-2 bomber is still the world’s best, its first flight was in 1989. America’s other bombers are the 1980s era B-1 and the even older 1950s era B-52 (with multiple upgrades, the B-52 is expected to stay in service until the 2040s). Washington clearly is in need of a new generation of long-range bombers. For such a bomber to be viable it must meet certain benchmarks: it must be stealthy, it must be able to deliver large conventional as well as nuclear payloads, and is must not break the bank. Enter the Long Range Strike Bomber program, or LRS-B. While many of the details of the program are classified, according to at least one source, the aircraft is expected to have a range of 6,000 nautical miles. Clearly the program has been crafted to replace America’s aging bomber fleet while being able to tackle the A2/AD challenges that are only growing as time passes. “I am also very supportive of the Air Force’s concept for a long range strike (LRS) family of systems, including the next generation bomber,” Forbes explained. While $600 million has been allocated towards research for the new bomber program with almost $9 billion estimated to be spent by 2018, it remains to be seen whether sequestration could kill such efforts. If so, Washington’s ability to strike targets across the world via traditional bombers will be in serious jeopardy as its fleet averages 33 years in age. For all the debate here in Washington about AirSea Battle, in some respects, the budding operational concept is already in use. From somewhere beneath the waters of the Mediterranean Sea, U.S. guided submarines launched cruise missile strikes on targets in Libya in 2011. Their goal: to degrade the command and control systems of Gadhafi’s military and destroy the air defense networks protecting his forces. While Gadhafi’s A2/AD capabilities were modest compared to those of China or Iran, the Libya example was a telling demonstration of the capabilities of nuclear attack subs heavily armed with cruise missiles. When strikes come from below the seas and out of sight, the advantages of A2/AD weapons and strategies seems to slip away. More than a decade ago, Washington started the process of converting four Ohio-Class ballistic missile submarines, traditionally armed with nuclear tipped ICBMs, and rearming them with vast numbers of land-attack tomahawk cruise missiles. This technology allows U.S. naval forces to introduce into the battlespace large amounts of ordinance that even the most sophisticated A2/AD network would have a hard time finding, yet alone destroying. There is only one problem: by 2027 the first SSGN will face retirement, with more to quickly follow. Considering the long timelines needed to plan for a replacement as well as the high cost in ship building, sequestration all but dooms a direct replacement to these important weapons of war. However, an easy solution could be increasing the size of existing Virginia-class attack subs, or SSN’s, to include Tomahawk missiles in their weapons inventory. Distributing small numbers of these weapons across newer generations of attack subs could at least in theory be a viable alternative to new SSGN’s, saving billions of dollars in development costs while preserving a key capability. The idea is already being developed in the Virginia Payload Module. In fact, the U.S navy recently selected a design concept for the project. While unmanned strike aircraft, new bombers or highly capable submarines all have promise, Washington’s political paralysis could keep such weapons on the drawing board. If sequestration were to stay in place, next year’s cuts could be even more damaging than those made to date. This summer, U.S. Secretary of Defense Chuck Hagel declared ominously at a press conference that if sequestration were to stay in place, up to three aircraft carriers could be mothballed, and massive cuts in size to the Army and Marine Corp. could be made. Recent reports even noted possible cuts to military benefits, something unthinkable in years past. The challenge for America’s military is a complex one. After an era of large-scale military commitments around the globe, a “peace dividend” seems a logical choice for a nation that is war weary. One only needs to look to the recent reaction to the talk of U.S. military strikes on Syria as evidence. Yet the U.S. is still a global superpower with worldwide commitments and an alliance network of partners that depend on Washington to keep the peace. The U.S. needs to develop a grand strategy that seeks to confront and defeat the anti-access challenges of the future while keeping in focus budget realities and the political challenges of the present. “If sequestration is allowed to continue, nearly every aspect of our larger national defense strategy will be detrimentally impacted, including the ‘rebalance’ to the Asia Pacific,” Forbes said. Despite a challenging budgetary and political environment, America has the potential to recalibrate its armed forces. This can be done with a commitment to developing long-range strike options that enable its forces can fight at a distance while leveraging the U.S. technology edge. Such a goal is surely in the political interests of both parties. However, as another budget showdown looms here in Washington, nothing seems certain these days. One thing is clear: Without a new strategy, it maybe America’s armed forces that pay the ultimate price when called upon to serve. Harry J. Kazianis is Managing Editor of The National Interest and former Editor of The Diplomat. The retired aircraft could help fill a significant capability gap for carrier strike groups.